The Gloom skin is a deep, rich purple with a delicate but chaotic pattern on the brow. There is some patterning on the back, as well. It comes packed with Envoy eyes. The Pixie Orchid skin is pale and gently pink and has intricate patterns covering brows, nose bridge and part of its cheeks. The chest and back are lightly patterned. It comes packed with Blossom eyes. The Pixie Moss skin is a dusky, deep green with lightly bluish patterning across the brow and parts of the body. 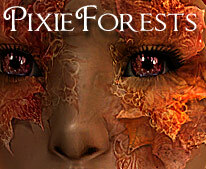 The Pixie Glory skin is very intricate with lace-like autumn leaves across the face as well as the rest of the body. It is a deep brown tone with orange and red leaves. It comes packed with Wine eyes. Gloom: Male hair by hysterical Paroxysm - Demused Sims, Female hair by Peggysims2. Orchid: Both hairs by Peggysims2. Glory: Male hair by SimsConnection, female hair by Peggysims2.